A local customer of ours purchased this rare 16/60 eight years ago having looked for one for some time. It had only covered 54,000 miles with two owners since new and was in good condition. Classic Car Services of Harrietsham were tasked with rebuilding the lower half of the car which was showing signs of age, and the invoice for nearly £5,000 along with photographs of the work, are in the history file. 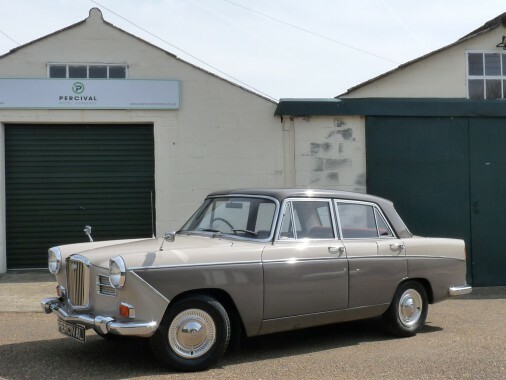 The Wolseley was supplied new in 1962 to a Mr. Westley by Turnbulls of Plymouth, and he kept the car until 1977 whereupon it passed to a Mr. Brown who looked after it until 2010 when our chap bought it. He is an enthusiast having owned all sorts of classic cars including a Wolseley 6/80, a Dolly Sprint, a Minor Traveller and various Jaguars. It has now covered 59,000 miles and has been serviced and MOT'd every year since 2011 and it's current MOT runs to April 2019. The bodywork remains in excellent, rust free condition and the shutlines are all very good. The interior is lovely and original with little wear. The carpets have renewed as they wear rather threadbare. This 16/60 has a four speed manual gearbox with a 1622cc, four cylinder engine and drives very nicely having been well maintained. The history file shows lots of care and also includes brochures, some old MOT certificates and the Driver's handbook. It also has a modern CD/radio fitted. A fine car for the show season.